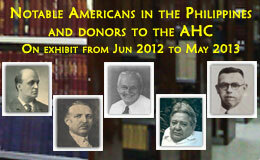 The American Historical Collection (AHC), established in 1950, consists of some 13,518 books, 18,674 photographs, and other materials related to the American experience in the Philippines and the relationship of the two countries. With the possible exception of the holdings of the U.S. Library of Congress, the AHC is the largest, most diverse and most complete collection of materials of this kind in the world. American Chamber of Commerce of the Philippines, Inc.